…The sheer gratuitousness of the grace of salvation is particularly manifest in infant Baptism. The Church and the parents would deny a child the priceless grace of becoming a child of God were they not to confer Baptism shortly after birth. For the grace of Baptism to unfold, the parents’ help is important. So too is the role of the godfather and godmother, who must be firm believers, able and ready to help the newly baptized – child or adult on the road of Christian life. Their task is a truly ecclesial function (officium). The whole ecclesial community bears some responsibility for the development and safeguarding of the grace given at Baptism. The ordinary ministers of Baptism are the bishop and priest and, in the Latin Church, also the deacon. In case of necessity, anyone, even a non-baptized person, with the required intention, can baptize , by using the Trinitarian baptismal formula. The intention required is to will to do what the Church does when she baptizes. The Church finds the reason for this possibility in the universal saving will of God and the necessity of Baptism for salvation. The Lord himself affirms that Baptism is necessary for salvation. He also commands his disciples to proclaim the Gospel to all nations and to baptize them. 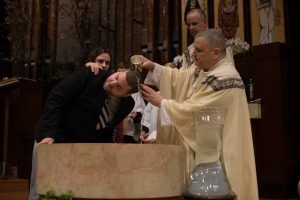 Baptism is necessary for salvation for those to whom the Gospel has been proclaimed and who have had the possibility of asking for this sacrament. The Church does not know of any means other than Baptism that assures entry into eternal beatitude; this is why she takes care not to neglect the mission she has received from the Lord to see that all who can be baptized are “reborn of water and the Spirit.” God has bound salvation to the sacrament of Baptism, but he himself is not bound by his sacraments. Baptisms for infants are celebrated on the First, Second and Third Saturday of each month, following the 9:00am Mass (10:00am) and are limited in size to four baptisms per Saturday. We require that the parents be registered at St. Mary at least 90 days prior to the baptism. For information on how to register visit Join St. Mary. Parents must attend a Baptism Class. The classes are held the 1st Thursday of each month at 7:00pm in the Activity Center. Please call the parish office to register 540-373-6491. St. Mary celebra Bautismos en Español, el cuarto Sábado del mes a las 10am (en Español). Para informaćion de como inscribirse, visite Join St. Mary. St. Mary requiere que los padres y padrinos atiendan una clase especial de Bautismo. La clase se ofrece el primer Sábado del mes a las 2:00 p.m. en la biblioteca del Centro de Actividad. Si tienen alguna pregunta, por favor, llamen a la oficina de la parroquia al 540-373-6491. Children and youth ages 8-16 who wish to be baptized attend the RCIC Program (Rite of Christian Initiation for Children). 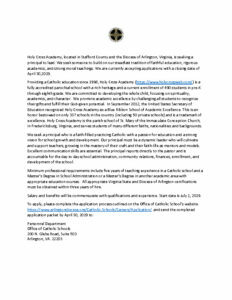 This is a two year program offered by the Religious Education Program of the parish. Preparation for the sacraments of initiation (in this case, children receive all three sacraments of Baptism, Confirmation and Eucharist) begins with classes in the fall and are completed with the reception of sacraments at the Easter Vigil Mass. To register for this program or for more information, please call the Religious Education Office at 540-373-6491. Children who are already validly baptized who wish to be received into the Church may join the regular cycle of religious education to receive First Holy Communion or, if they are older than other students studying for sacraments, they may be enrolled in a special sacraments class offered by the Religious Education Program. By receiving Communion their profession of Faith in the Church is validly received. Adults interested in learning more about the Catholic faith and moving toward Baptism or Reception into the Catholic Church (already validly baptized) are welcome to join our RCIA Program (The Rite of Christian Initiation for Adults). This series of meetings/classes begin in September and meet weekly Monday’s 7:30-9:15pm. Some special trips and liturgical participation included throughout the year. The program culminates with the reception of the Sacraments of Initiation at the Easter Vigil Mass: Baptism (if necessary), Confirmation and Eucharist. For information about the Program, please contact the parish office 540-373-6491.